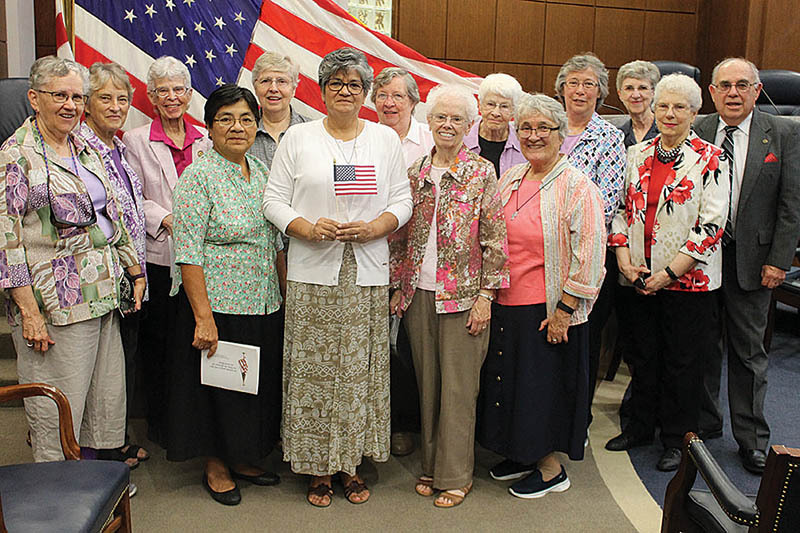 KANSAS CITY, Kan. — In front of a large contingent of her fellow Sisters of Charity of Leavenworth, Sister María de los Milagros Orozco Olaya took the oath of citizenship with 90 other applicants Aug. 17 during a naturalization ceremony here at the Robert J. Dole U.S. Courthouse. Sister María was one of three Peruvians and — to her knowledge — the only woman religious in the group becoming a citizen. She has been an SCL for 32 years, having joined the community in her native Talara, Peru, as an Hermana de la Caridad (Spanish for “Sister of Charity”). Sister María’s path to U.S. citizenship dates to 1992 when she first came to the Midwest as an observer at an official meeting of the SCL community. She returned in 1996 when U.S. Sisters hosted the Peruvian Hermanas to familiarize them with ministries in this country. During these early trips, Sister María had no plans to remain in the United States. But in 2002, she came to study English at Donnelly College in Kansas City, Kansas, and then eventually requested the opportunity to learn more about the roots of the community in the Midwest. In 2004, Sister María traveled to Kansas for 12 months — a trip that she said expanded into 14 years. She volunteered at All Saints Parish in Kansas City, Kansas, where she was able to help the teachers at the school by communicating in Spanish with the parents of schoolchildren and assisting the staff to better understand their needs. The next part of her journey involved parish ministry at St. John the Evangelist Parish, also in Kansas City, Kansas, with responsibilities for RCIA and formation of parents in family catechesis. In 2007, she added Holy Cross in Overland Park to her ministries. Then, she joined the archdiocesan Hispanic ministry office in adult formation. For several years, she served all three of these ministries. Gradually, Sister María left parish ministry and became more active in the archdiocesan office. In 2014, she began working full time at her current position as general coordinator of evangelization for the Hispanic ministry office. In her current ministry, Sister helps Spanish-speaking people prepare for the sacraments and look for jobs, and she accompanies them and often interprets for them at immigration offices, detention centers, etc. She’s also available to listen — whatever the problem may be. “I feel that they trust me now even more because I was an immigrant and became a citizen,” she said. “I want to invite those who are still afraid to approach those who are different — whether in language or culture — to take steps to go forward hand-in-hand with God as people who walk in faith,” she added. “We want to foster a world of love and equality to build the kingdom of God,” she continued, “where we can sit at the table with those representing the different faces of God.